Even Goethe needed more time for a short letter than for a long one! You always need more time for a short concise letter. Because if you just write everything down quickly, the letter automatically becomes way too long. Getting a message to the point is always a lot harder, because it requires effort and brain power. But the recipients will always thank you for your efforts. This is exactly what makes the difference between quantity and quality. Of course, the content of the handwritten message is a very important success factor. If you write just as you think, then random thoughts string together. This only ever corresponds to a very rough – usually not completely thought-out – design. In the same way, the letter is always far too long and bad. A handwritten letter is a tangible thing, something that engages our senses in a way that technology cannot. They are a physical reminder of the writer, their thoughts forever etched onto a physical object. Your reader will not soon forget you, if you have considered the success factors. Whereas printed letters are mostly only skim read, i.e. 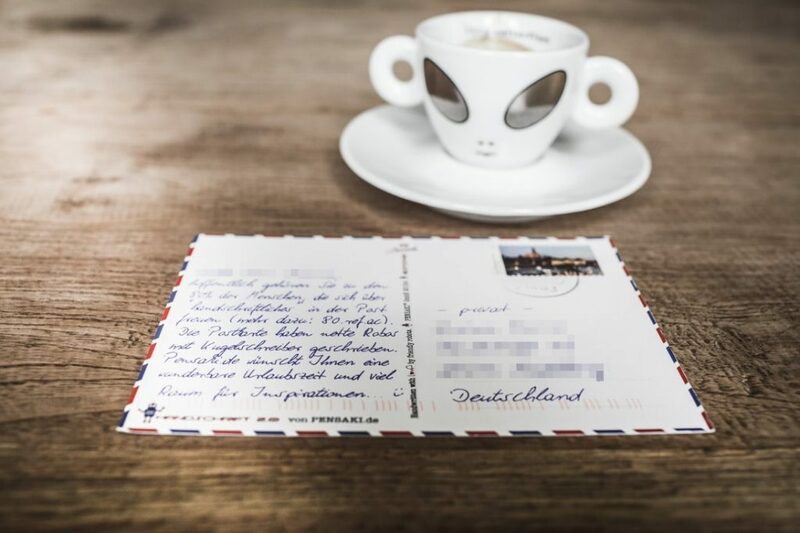 the content quickly disappears from the human brain, handwritten letters are read completely. Please make sure that your handwritten messages are always PCR (personal, concise and relevant). "We have invited several thousand executives to our festival with handwritten Pensaki invitations and the response was great." "Good old handwriting boosts leads for DIGITAL Oracle Eloqua CAMPAIGN. Lead conversion rate of around 40%! Like it." "We've achieved an attendance record at our event and received a lot of great feedback, largely due to the handwritten invitations from Pensaki." 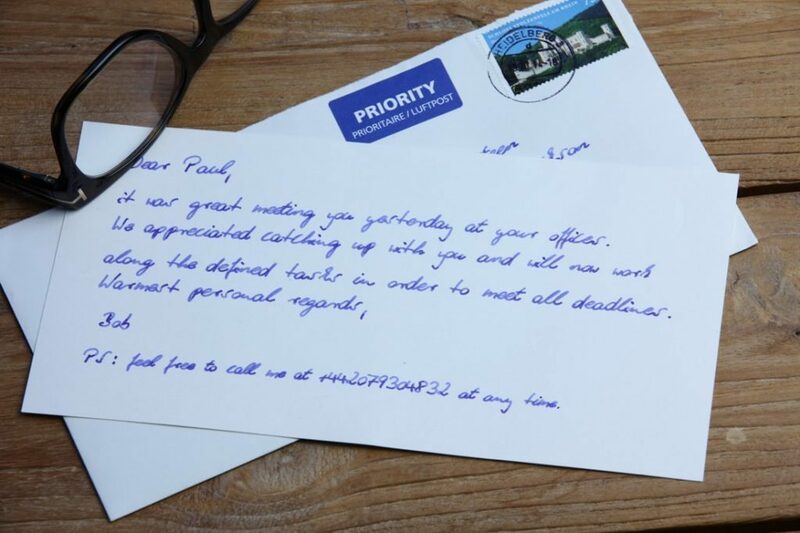 Pensaki is possibly the coolest marketing service I've seen, and this is due to their on demand, handwritten, direct mail services"
"PENSAKI delivers great results. It's unusual and effective." "Superbe online service, indistinguishable from a (human) handwritten card. We are a satisfied customer for several years already." Be Truthful, Be Concise, Be Relevant, Be Clear ! In the short term the spice lies! But a good and “spicy” letter can only come into being if you think about it in advance and develop an exact idea. In which order do you want to lead the reader to the relevant content? What arc of tension should follow this? Question each sentence as to whether it really adds value for the recipient! This work takes time – the longer and more complicated a letter, the more time you need to simplify the text. request. This is a handwritten card with up to 400 chars. A friendly robot has used a Lamy fountain pen for you. I hope my message finds you well in Stockholm. European Symposium on Artificial Intelligence in Berlin. We have reserved a VIP ticket for you until March 26th. successful business year at Sample A/S. a VIP ticket for you until March 26th. from various key industries across Europe. Gefühle sind der “Grundstoff” unserer Existenz. Dennoch unterschätzen wir die Rolle angenehmer Emotionen. Sie sind bekanntlich auch wesentlich für soziale Bindung. ganz besonderer “Überträger” von positiven Emotionen. Kunden zu gewinnen bzw. Bestandskunden zu pflegen? PS: unter roi.ref.ac erfahren Sie mehr. Ihnen austauschen. Gerne auch telefonisch. Liebe Frau Müller, ich hoffe, es geht Ihnen gut. Dasein versunken, daß meine Kunst darunter leidet. 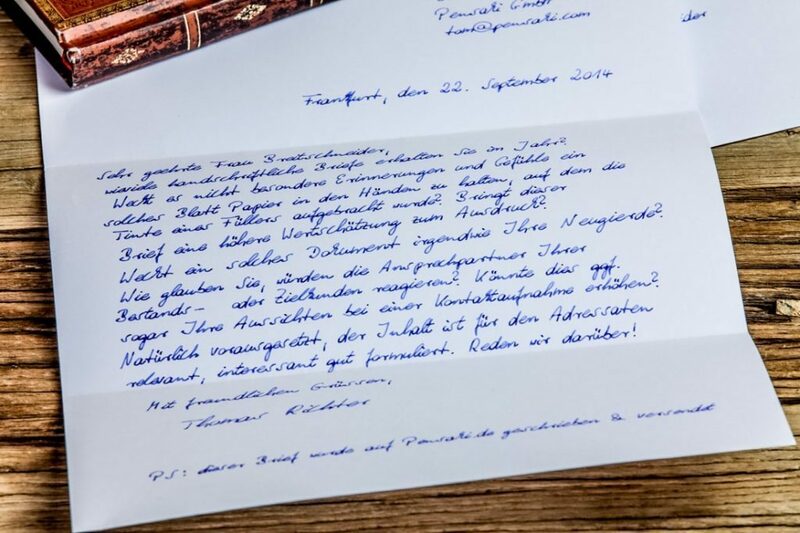 Warum wirkt Handschrift eigentlich im Digitalzeitalter? Wertschätzung zählt - lesen Sie mehr im Blog! gratulieren wir Ihnen ganz herzlich. Frohsinn für Ihr neues Lebensjahr. unseren treuen Kunden zählen dürfen. We couldn’t answer your question? Our Helpdesk Team will be happy to help you.